This letter explains in narrative form why an employee's performance is unsatisfactory and puts him or her on notice that their job is in jeopardy. You must take immediate corrective action and resolve this problem if you wish to continue to be employed by this company. If you do not do so, we will have no choice but to seriously consider terminating your job. 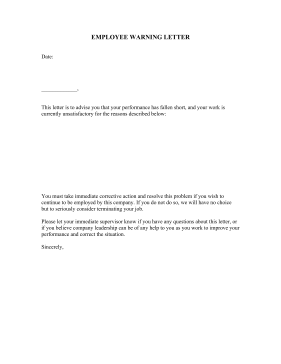 Please let your immediate supervisor know if you have any questions about this letter, or if you believe company leadership can be of any help to you as you work to improve your performance and correct the situation.